Correct Wheel Sizes, PCD, Offset, Rims and Tire specs for Subaru Forester series. Hi, I have 4 x 225 60 R16 winter tires and wonder whether it fits to my 2002 Forester Sport 2.5L that currently have all season tires of 215 60 R16 on the alloy rim. If so, what size and spec of metal rim that I should buy for the winter tires? Thanks in advance for your advice. Will 235/75/15 fit on my 2001 forester? I have subaru forester 2013 which only fitted steel wheels. Base on your website, the actual alloy wheels for this car is 17x7 ET48. Is that okay if I fit cx5 wheels ( 17x7 ET 50) to my car. My main concern is the offset between those wheels. will 235/60/16 fit on my 2011 Forester XS? Hi,Bernardo,Yes,235/60/16 can fit for your car. 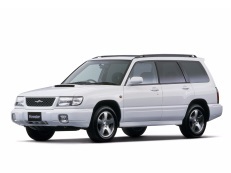 just bought a subaru forester XS limited AT2000cc year 2009, and I would like to lift it . Can I change to rim 18" ? or 17"? how can I do it? hoping to get anothers suggestions. I know my 2001 Subaru Forester has wheels size 15. I was wondering if I put size 17 wheels from a 2006 WRX would the tires cause any damage to the car? Hi, lizardo,Yes.You can put that tire on your car. Will subaru forester allow wheels fit ford australia stud pattern? Can I down-size my 2011 Forester XT 17" wheels to the non-turbo 16" wheels. I'm getting yes and no from different dealerships. Has anyone tried it? Will it mount ok or cause damage? Hi,Rich,Yes,according to OEM tire size,it can fit for.And if you can show your both current tire size,I can confirm it better. I don't know the exact tire size, but I do know the outback are 16" rims, and the forrester are 17" rims. Hi,Rich,If they are not any custom wheels,You also need to confirm the bolt pattern ,if the tolerance within 5mm,it can fit for. A little confused on the offset specs for 2016 Subaru Forester 2.5 premium. Specs page says 48mm but another panel says 43mm to 48mm is it variable? Anyone know if 235-60-16 fit on my 2005 outback? the stock size is 225-60-16. I am replacing all 4 tires. Hi i have a 2003 forester with standard 205,70,15 can i change them to outback wheels 225,55,r17 i have read someone saying they had fitted larger wheels than there standard ones and had to file down brake calipers ? i dont see why as the wheels were larger ? interesting forum, thanks a lot. 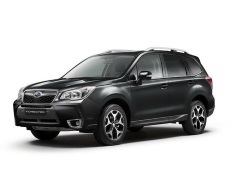 I have a subaru forester X limited AT 200occ. year 2009.
it uses rim 16" and tire 235/ 60/16, but I would like to rise the forester . the 17" rim 7J x 17 ET 48 fits good. Hi,ALBERTH,Can you explain your questions?If you want to know whether 17'' rims can fit,Yes,it can fit for and make sure the bolt pattern are same. Hi,Markos,I think 22'' is too large for your car.the stock rims size for your car is 17'',20'' is the largest size. I have an X reg (2000) forester s turbo UK Spec and need to know if I can put 5x100 16" 205 /50R16 on it? Found a set really cheap in black and they would make the car look so much better but don't want to waste money if they're not suitable for the car. Hi,Benedict,The wheel bolt pattern,size is ok,How about the wheel offset?And what your current tire size ?You can show me and then i can help you confirm it. Hi,Jimmy B,No,They have different bolt pattern So they can't fit for each other. I have a 2009 outback, that uses 16" tires. But I have good Snow tires from my legacy which are 14" can I use them on my new outback with the appropriate size rim? Hi,Dale,No,14'' rims is too small. I just bought a 2015 Forester with 17" tires and was wondering if my 2015 Outback 16" snow tires will fit. My tire size is 225/60 R16 and the tires are mounted on 16" rims for the 2005 outback. The bolt pattern looks the same, however I am not sure if they will fit. My Forester tires are P225/60 R17. oops... 2005 outback snow tires! Hi , looking to change rims an tires on 2009 forester log pattern 5x100 with tires 215/65/16! I'm confuse a lot .. I don't understand all this I need help thank you ! What tires dimensions and rims the going to fit? Hi,Rec,Do you have any request for the new tires and rims?More bigger or Just like stock wheels and tires,You need confirm firstly. Hi I just buy the 09 Forster great car but I don't like the rims and I have one damage rim and tire and I buy few months ago for anothe car new rims and tires and I sold it I have the rims and the tires and I don't know if they going to fit on forester! The rims they are 16x7 5-108.00/114.30. 38 DGGLXX and the tires are215/55/16 97H XL BSW ! I will appreciate if you can tell me if they going to fit on my 09 forester! Hi,Rec,the foster bolt pattern is 5*100,your rims is 108/114.3.They are not fitable. Just bought a 2017 Subaru Forester with 17" alloy wheels. I have the 16" steel rims with mounted snows from our 2006 Forester. Will these fit the new vehicle (bolt pattern/offset/caliper clearance)? Will the working diameter of the tire be similar? what is the bolt pattern on a 2014 2.5i Forester rim and what is the bolt pattern on a 2002 Forester, and are they interchangeable. Thanks much! Hi,Julie,The bolt pattern is 5*100 and it can interchangeable. Is Impreza 2008 6.5Jx16 ET55 Rims can fit Forster X 2011. I am worried about offset. Kindly advice. Hi,Ahmed,The offset for them are 45mm.it is not a problem.And For the bolt pattern,Impreza have two size,one is 5*100 and another is 5*114.3,Before fit the wheels,you need also confirm it. Thanks , I thought ET55 means 55mm offset and it may not fit. I have a subaru forester 20o4 ittakes 215 60 r16 i was wo dering if i can put 5 bolt like mine ut 215 60 r15 on take he said from a nisson. Hi,Dawn a,No,215/60/15 is not compatible for your car. There's some great info in here! I have a 2012 forester. What is the largest tyre size you can put on the car? Is it better to add spacers to go a little wider? 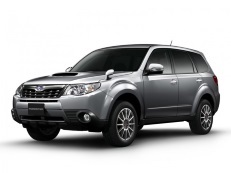 Subaru Forester XT Premium AUDM - tou have listed that the 225/55 R17 load rating is 98V. However the standard tyres are Yokohama GEOLANDAR G95A, which are 97V. I am struggling to work out which is the correct load rating I should target. Please investigate and update your site accordingly. Hi,Damon,The 225/55/17 loading rating is 97V,not 98v.We will update the data. Hi,Donovan,The stock wheel offset is 48mm,I suggest that the lowest offset is 43mm. hi, What I would really like to is swap out my current tire 215/60/16 to 215/65/16. will the handling be affected would the speedo reading be correct? would fuel be affected??? Hi. 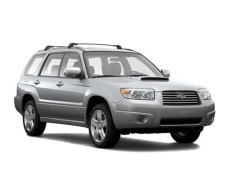 Can I use rims from a 2008 Subaru Outback on my 2012 Subaru Forester. My winter tires are 255/55 R17 and rims were taken from tires with the same measurements. Just not sure if there is anything else I should be aware of. Hi,Liz,If all rims and tires are same except j and jj,You you do not need to worry about it.Because j and jj is the wheel structure code.if rims were tabken from tires,they are compatible. Thanks for your reply. I just realized that the aspect ratio is different. 55vs60. Will this affect the potential rim swap? Hi,liz,you'd better show aspect ratio 60 tire size,I can help you confirm it. Thanks. My tires are 225/55/R17 and rims are on 225/60/R17. Offset and bolt pattern are the same. I have an 01 Outback (6.5JJx16 ET48 wheels) and just purchased an 07 and need winter tires/wheels. I have 2 questions. 1. can I run the 01 wheels (I have separate set of winter tires/wheels for it) on the 07? or 2. I have a 2012 set of wheels (7JJx17 ET48, with TPS) that I can purchase winter tires for and mount those on the 07. Which is preferable? Hi,Chris,For your questions,1.yes,you can use 01 outback wheels on 07 outbacks if both wheels are stock wheels.2.You can also use 2012 set of wheels on 07 outbacks,They have same size on stock rims. will 16 in rims and tires from my 2013 forester 225/60/16 fit on my 2018 Forester with 17 inch wheels / 225/60/17. I have a 1999 Subaru Legacy Outback that has 15" wheels can I put 14" wheels on it? Hi,Mantas,What the car model and year of your car? hi,i have a 00 forester with stock 15” and want to upgrade to 16” wheels, whats the biggest size tyre I can put on with stock suspension?